When scrapping vehicles equipped with a seat belt pretensioner or disposing of a front seat outer belt (with a seat belt pretensioner), always deploy the seat belt pretensioner first in accordance with the procedure described below. If any abnormality occurs during deployment of the seat belt pretensioner, contact the SERVICE DEPARTMENT of TOYOTA MOTOR SALES, U.S.A., INC.
Never dispose of a front seat outer belt assembly with a pretensioner that has not been deployed. 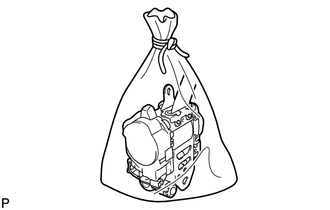 The seat belt pretensioner produces an exploding sound when it deploys, so perform the operation outdoors where it will not disturb local residents. 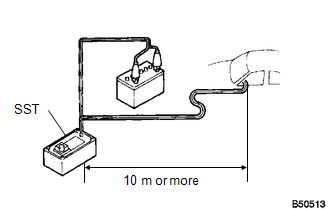 When deploying a front seat outer belt (with a seat belt pretensioner), perform the operation at least 10 m (33 ft.) away from the front seat outer belt. Use gloves and safety glasses when handling a front seat outer belt with a deployed pretensioner. Do not apply water, etc. to a front seat outer belt with a deployed pretensioner. When deploying the seat belt pretensioner, always use the specified SST (SRS airbag deployment tool). Perform the operation in a place away from electrical interference. Be sure to follow the procedure listed below when deploying the seat belt pretensioner. When deploying the seat belt pretensioner, always use the specified SST. 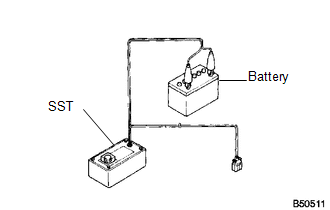 (1) Connect the red clip of SST to a battery positive (+) terminal and the black clip to a battery negative (-) terminal. At this time, do not connect the yellow connector. It will be connected to the seat belt pretensioner in later step. 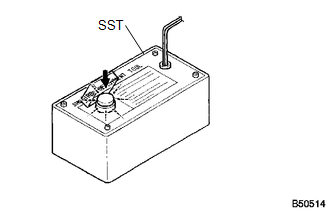 (2) Press the SST deployment switch and check that the LED of the SST deployment switch illuminates. 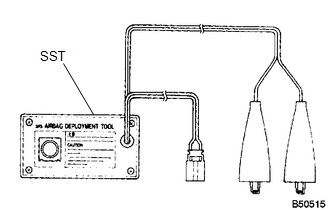 If the LED is illuminated when the deployment switch is not pressed, SST may be malfunctioning. In this case, do not use the malfunctioning SST. 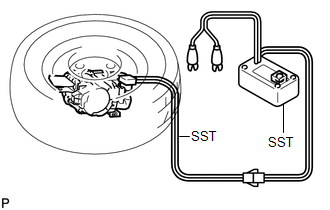 (1) Connect 2 SST, and then connect them to the front seat outer belt pretensioner. To avoid damaging the SST connector and wire harness, do not lock the secondary lock of the pretensioner connector. (2) Move SST at least 10 m (33 ft.) away from the front of the vehicle. (3) Close all the doors and windows of the vehicle. 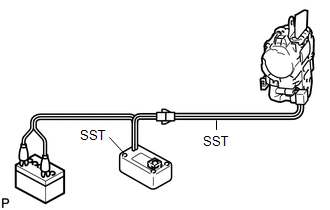 Do not damage the SST wire harness. (c) Deploy the front seat outer belt pretensioner. (1) Confirm that no one is inside the vehicle or within a 10 m (33 ft.) radius of the vehicle. (2) Connect the red clip of SST to a battery positive (+) terminal and the black clip to a negative (-) terminal. (3) Press the SST deployment switch to deploy the front seat outer belt pretensioner. The seat belt pretensioner will deploy at the same time as SST LED illuminates. (d) Dispose of the front seat outer belt assembly. (1) Remove the front seat outer belt assembly and SST. (2) Dispose of the front seat outer belt assembly in accordance with local regulations. The outer belt becomes very hot when the front seat outer belt pretensioner is deployed, so leave it untouched for at least 30 minutes after it has been deployed. Use gloves and safety glasses when handling an outer belt with a pretensioner that has been deployed. Do not apply water, etc. to a front seat outer belt assembly with a pretensioner that has been deployed. When scrapping the vehicle, deploy the front seat outer belt pretensioners, and then scrap the vehicle with the deployed outer belt installed. When disposing of a pretensioner equipped front seat outer belt, never deploy the belt in the customer's vehicle. (2) Place the outer belt on the ground and cover it with a tire and wheel assembly. Position the front seat outer belt assembly as shown in the illustration. 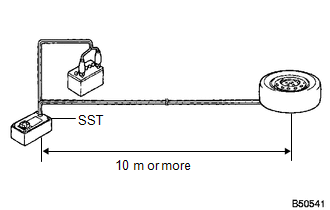 (3) Position and hold SST at least 10 m (33 ft.) away from the wheel. (1) Check that no one is within a 10 m (33 ft.) radius of the wheel. (2) Connect the red clip of SST to a battery positive (+) terminal and the black clip to a battery negative (-) terminal. (1) Remove the wheel and SST.